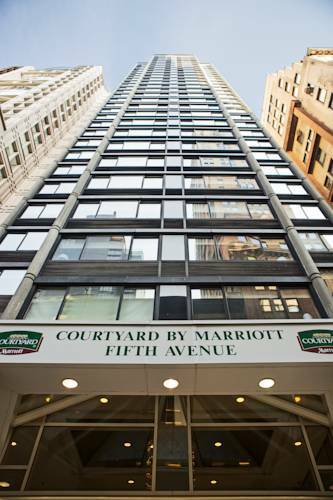 Style and comfort come together at Courtyard New York Manhattan/Fifth Avenue. Wake up each morning with a view of the city in our deluxe guest rooms featuring comfortable beds with crisp linens and fluffy pillows. At home entertainment is readily available with our flat-panel LCD TVs and free wireless internet. Each morning at our hotel is easier with our on-site Starbucks , featuring all your favorite signature drinks and cafe-style meals. Staying in shape is made easier with the on-site 24-hour fitness center featuring modern cardio equipment and well-managed free weights. Then, host a memorable celebration and provide accommodations for guests with our special group booking rates. Find your latest adventure within walking distance like the iconic Broadway and Times Square, or the timeless New York Public Library. Be sure to visit the blend of nature and metropolitan style at the nearby Bryant Park and Central Park. Reserve your upcoming stay in the heart of the city today.